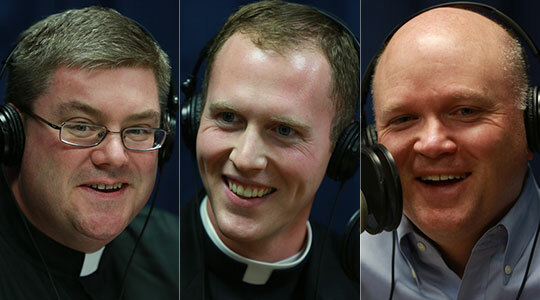 Summary of today’s show: Even 16 months after ordination, Fr. Mark Murphy remains the youngest priest of the Archdiocese of Boston and he’s now serving in one of the busiest and largest parishes, St. Agatha’s in Milton/Quincy. Fr. Mark shares with Scot Landry and Fr. Chris O’Connor how his first year as a priest has gone, the unique and welcoming way his parish has received him, the challenges of serving a parish with as many people coming to daily Mass as some parishes get on Sunday, and how he’s managed to improve his already superior golf game. 1st segment: Scot Landry and Fr. Chris O’Connor talked about Christopher Columbus Day. Fr. Chris said he was in Washington, DC, over the weekend, getting together with his priest-friends he made while he was in graduate school at Catholic University. He visited the National Zoo, the home of Elizabeth Ann Seton, and a Trappist monastery. Scot said it’s never too late to start praying the Rosary novena to stop assisted suicide. This week also kicks off the Year of Faith on Thursday. Fr. Chris said St. John Seminary is hosting an open-house for all fifth graders, boys and girls, and their families to see what the seminary is all about and to talk about vocations. He said studies show that young people start thinking about vocations at the fifth grade. This will be on October 21 and October 28 . Interested people should register through their school or parish. 2nd segment: Scot and Fr. Chris welcomed Fr. Mark Murphy to the show. They discussed Fr. Mark’s golf game yesterday, when he shot a 79. He said he’s been playing since he was 13 years old and his game has improved since ordination mainly because he never had time to play in seminary. Fr. Mark has been ordained about 16 months now. He’s been at St. Agatha Parish in Milton. Part of the reason for his wonderful experience is the life of the parish. They get 150 people or more at the several daily Masses. They’ve noticed the numbers increasing since mid-summer. They’re especially moved by the number of men coming as well as all the different ages coming. The daily Mass is held in a renovated chapel that is part of a large renovation of the lower church. He said they have six weekend Masses with about 2,400 people. The largest Mass is the Saturday vigil with about 500 attendees. Scot said that puts the parish in the top ten among parishes in the archdiocese in terms of attendance. Scot asked him how he tailors his homilies for such large crowds. Fr. Mark talked about the challenge of preaching at the family Mass when the children come up to hear a homily directed primarily at them. Fr. Mark said he takes his homily preparation to prayer at the beginning of the week, with the Masses he’ll be preaching that weekend in mind. Fr. Chris asked him what he preached on this past weekend, when it was about marriage. Fr. Mark said he talked about his priesthood lets him see marriages at all different stages, whether it’s weddings, baptisms, or funerals. He sees people living out their vocation to marriage so radiantly and lovingly together. He also discussed the difficulties and trials. He related a story of a conversation with an older parishioner who had been married for 50 years. Fr. Chris asked Fr. Mark what a typical day is like for him. Fr. Mark say they have about three funerals per week and he celebrates one or two of the Masses. He also celebrates one of the daily Masses. The school has 600 kids at pre-K through 8 levels and if he doesn’t have a funeral he visits the school in the morning, or in the afternoon if he does. He also has meeting with pastoral staff. He meets with couples preparing for marriage, goes to wakes, and so on. There are also the unexpected events, like someone coming to the door who wants to talk for an hour. He also tries to find time to exercise in the later afternoon and then get some prayer time in. Scot asked him how he has grown in his ministry with so many funerals. He said it is a moment of faith and evangelization, when people are thinking about the important themes of life and death. Fr. Chris talked about some of the challenges of funerals. He said it’s an essential moment to grieve and encounter the Lord, but also to commend that person to the Lord. He recalled a daily Mass communicant who opted not to have a funeral Mass so they wouldn’t have to go to church. Fr. Mark said we have to go back to the basics and explain why they are there, why do they use a pall, why is the paschal candle there. Scot noted that Fr. Mark is still the youngest priest in the Archdiocese at 27 years old. Fr. Mark said when he first got to St. Agatha’s a woman came up to him and said she didn’t realize they were ordaining 18-year-olds. He said it’s usually a positive and people are enthusiastic to see a younger priest. Fr. Chris asked what shocked him most about the priesthood. Fr. Mark said it’s the fact that it’s all-encompassing and time management is a challenge. Ordinary parts of time management are very important. He works hard at getting back to people who leave a message promptly. He’s also been surprised at how much fun it is, like school events or going to Canobie Lake Park with the altar servers. 3rd segment: Scot asked Fr. Murphy about the life that the school brings to the parish. Fr. Mark said he went to public school his whole life and it’s his first parochial school experience. Part of him regrets he didn’t get that chance. The teachers obviously love being there and teaching in that school. The kids are great and appreciate that he wants to learn their names. He often asks the classes what they’re learning in their religion classes and he finds that they are definitely learning their faith. On the question of the hardest question he’s received from a student, he said they had a teaching Mass, a simulated Mass, and at the end one of the kids asked why the priest smells the altar at the procession. They also want to know him as a person and often ask personal questions. Fr. Mark said there were four sixth graders last year who wanted to have lunch with him before the end of the school year. They had lunch in the principal’s office and it turned out that they had religious questions about God, their faith, their church. They wanted to know about the end of the world and what we believe about evil and the devil. They also had questions about his own call to the priesthood. It is a gift that the kids feel comfortable enough to sit down with him and ask him questions. Fr. Mark is also involved in many other sacramental obligations. He did twelve weddings last year. He’s also a chaplain in the National Guard which takes him away one weekend a month and 15 days per year. He said both the pastor and the Guard are flexible with his obligations. His ministry has helped him connect with veterans or with families who have someone deployed overseas. Fr. Chris asked how Fr. Casey has helped Fr. Mark in his first assignment. Fr. Mark said Fr. Casey has given him a great model in servant leadership. He’s a fantastic listener and Fr. Mark has had to grow in his listening skills. He also notices that Fr. Casey is prayerful and prayer is central in everything they do. Fr. Casey has been in the parish for 14 years and knows all the parishioners and has their respect. They see Christ in him in a powerful way. They see a strong faith in him. Fr. Mark said he didn’t know a lot about Milton when first arrived, but he found many people didn’t know his hometown in Burlington. They discussed how north and south of Boston are like two different worlds. Fr. Mark said they are technically a Milton and Quincy parish. He said the people have been very welcoming, inviting him into their homes and getting to know them. Fr. Chris asked what sets St. Agatha’s apart from other parishes he’s known. Fr. Mark said the high Mass attendance is remarkable as is the large parish school where 50% of the attendance is from inside the parish. Those are the strengths of the parish. He also noted the parish bereavement team that reaches out to families in those 150 funerals per year. Scot talked about the transition from the seminary and how he stays connected to his classmates from the seminary. Fr. Mark said once he was ordained he got a letter from the cardinal about an ongoing formation for priests ordained zero to 5 years. They come together once per month as a group for prayer, a speaker, or dinner with the cardinal. He said one of the benefits is to see the other newly ordained men. He said he and his classmates get together occasionally too and on their one-year anniversary they got together for dinner. Fr. Mark said the most beautiful part of being a priest was how much parishioners love their priests. As a seminarian you get used to people saying how happy you are to be studying for the priesthood, but as a priest you see how much larger that it is. HE thinks it’s because they know the priest and how he loves them and brings God’s grace to them. They love that the priest is the instrument of God’s grace to them and he embodies Christ and His Church for them. He said being a priest supersedes race and age. On the numbers of men coming to daily Mass at St. Agatha’s, Fr. Mark said there is a men’s collaborative group in Milton that meets monthly and many of those men come to daily Masses.